It was a typical sunny summer day like any other, but for Angela (name changed for privacy), it was an unusual day. Although excited to come to Renew for her weekly riding lessons with her friends from the Life Enrichment program at Benjamin’s Hope, once she arrived she did not want to leave the safety of the van. Her friends went in to begin their grooming and riding, but Angela refused to move and leave the security of the familiar space in the van. Not having words to speak, she just sat – not appearing to be upset, not sick, but not making any move to leave her seat. Renew staff and volunteers came out to the van with encouraging words to help her move along through the routine with the goal to ride, but to no avail, and the minutes ticked by. After about 15 minutes, when her friends were already mounted on their horses and Angela’s horse, Honey, was tacked and waiting for her, Angela was still in the van. Trying to think what Angela might need in the moment, Melissa, our Executive Director decided to try a new approach. Rather than bring Angela to Honey, why not bring Honey to Angela? So, along with her team, they trekked out to the parking lot to find Angela still sitting in the van. 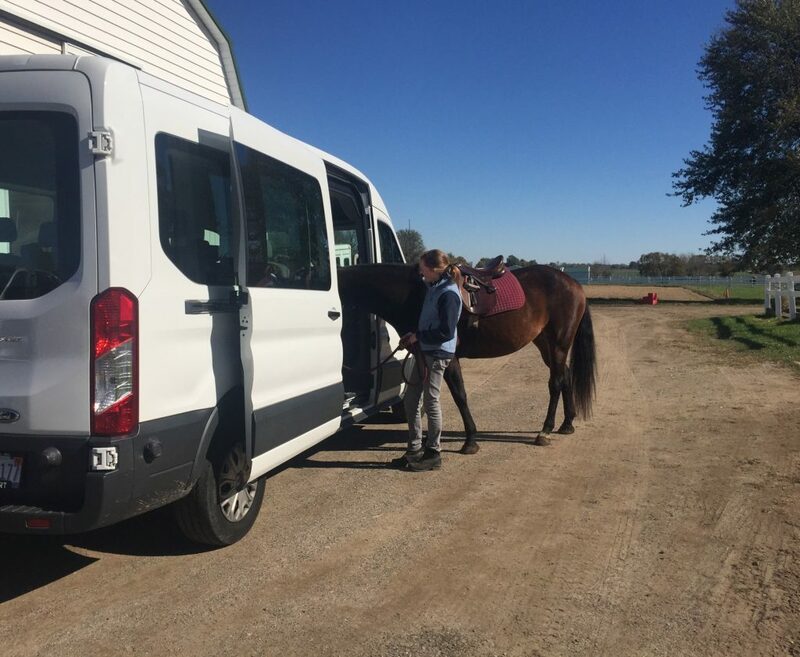 With the van door wide open, Honey and her team greeted Angela to let her know they would follow her lead when she was ready to ride. Well, it only took a minute for Angela to be ready. With a big smile and a pat on the nose for Honey, Angela emerged ready to ride. She got her helmet, mounted Honey in the arena, and joined her friends for a great lesson. Why did this matter? Because although Angela does not have words to speak, she communicated clearly to us that she needed something that was not being provided. She needed more encouragement, more support, and more reassurance. And we got to show her that she mattered by bringing her horse “out of the barn” and to the van. Not a typical day, but also not-so-out-of-the-ordinary at Renew. The horses, volunteers, and staff are willing to do whatever it takes to meet the needs of our beloved participants. And for Angela, this unusual day turned out to be a good day.